As a child, I remember the thrill of receiving my very first Pez candy dispenser, complete with a couple of refill packs. It was exciting to think that I could simply dispense candy for myself whenever I wanted, however much I wanted (limited only by the size of the dispenser). What a great idea! At the time, it didn’t even matter to me that the candy itself was not exceptionally delicious, nor that all the colors seemed to taste the same. I was simply happy to be able to have candy when I wanted it. In fact, I learned later that I could even pick the design of the dispenser that suited my preference — my favorite superhero could give me candy at my every whim. Pez candy was actually the first of many products-on-demand. By the time I got married and moved to Texas, there were drive-up windows at many restaurants, drive-through pharmacies, drive-through attorneys, drive-through car washes, and drive-through liquor stores. Now we have movies-on-demand, the ones we want, when we want them. Nearly everything is available at my personal convenience and according to my individual preference. It appears sometimes that we even view faith the same way, as a tool to get what we want when we want it. Sometimes I wonder what God thinks about this phenomenon. Is God really pretty much like a gargantuan Pez dispenser in heaven? Sometimes we treat Him as if He were simply that and no more . . . Once in awhile I hear my own prayers and, to my own horror, wonder if it is possible to be any more self-absorbed than I am? Do I really go to the Creator of the universe and commandeer Him to cater to my every preference and make the delivery convenient for my schedule? Sometimes it seems that I am using Him just like that first Pez dispenser — as a way to get what I think I want and need. It’s not wrong, of course, to take our needs to God. Peter instructs us to cast all our cares on Him, because He cares for us. (I Peter 5:7) Matthew 6:8 tells us that God actually knows our needs before we ask. Luke 12:32 goes a step further and explains that it is our Father’s good PLEASURE to give us the Kingdom. However, I believe my attitude and motive in asking could often use an adjustment. I have spent many years instructing my children in how to request things politely, kindly, and in the right tone of voice. We have had many discussions on examining our hearts to be certain we have the right motive when we ask for things. How much more should I examine my heart when I submit my requests to our amazing, loving, all-powerful heavenly Father?! Am I really praying out of faith in Him as my Source of life and provision, or am I whining and begging out of my own fear that He doesn’t really care after all? Am I praying in such a way that my requests reflect His will and character? Do I just want Him to remove pain and pressure, or do I really long for Him to transform me and reveal Himself in and through me in difficult situations? Do I want Him to make me look good, even “spiritual,” or do I want His Name to be honored and His glory to be revealed? God is not God-on-Demand. Instead, He is the God who sees me, the God who provides, the God who heals me, the Lord who was, who is, and who is to come. He alone is the One who made me, a tiny speck in the vastness of time and space. He demonstrated His profound love for me by sending a part of Himself to die for me on the cross. He clearly loves me! Should I not respond in awe and wonder and ask Him what His will is and how He wants to breathe life into those around me? — Or do I really think that all I want is an orange Pez to temporarily satisfy my spiritual sweet tooth? Thank You, Father, that You are faithful to expose my selfishness and shallowness, my wrong motives and pettiness. You only expose for the purpose of healing me! 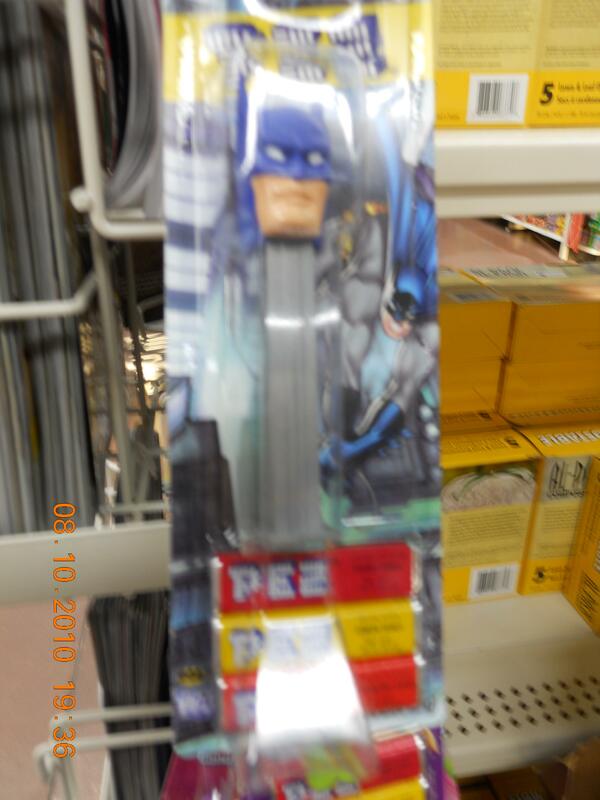 Forgive me for treating You, the King of the universe and Lord of my heart, as if You were nothing more than my favorite cartoon super-hero Pez dispenser, releasing spiritual goodies at my every whim. Forgive me for asking You simply to bless me and what I do, rather than asking You to bless others and impart Your life and presence to them. I DO want Your presence and power to fill me, Lord, and to overshadow me. I do thirst for Your Spirit to transform me and make me more and more like Jesus! (I Cor.3:18) Do YOUR thing in me, Lord, not mine! ← Are You Really Out There Somewhere?